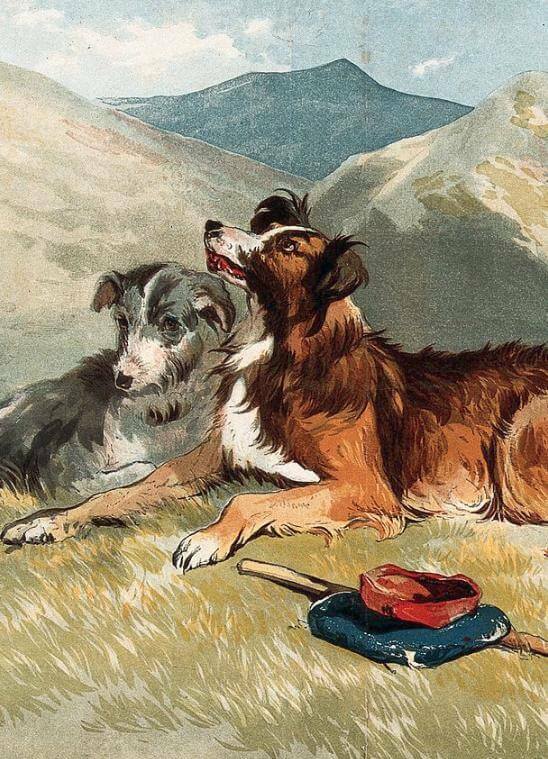 A Yellow Dog is featured in our collection of Dog Stories. I never knew why in the Western States of America a yellow dog should be proverbially considered the acme of canine degradation and incompetency, nor why the possession of one should seriously affect the social standing of its possessor. But the fact being established, I think we accepted it at Rattlers Ridge without question. The matter of ownership was more difficult to settle; and although the dog I have in my mind at the present writing attached himself impartially and equally to everyone in camp, no one ventured to exclusively claim him; while, after the perpetration of any canine atrocity, everybody repudiated him with indecent haste. "Well, I can swear he hasn't been near our shanty for weeks," or the retort, "He was last seen comin' out of YOUR cabin," expressed the eagerness with which Rattlers Ridge washed its hands of any responsibility. Yet he was by no means a common dog, nor even an unhandsome dog; and it was a singular fact that his severest critics vied with each other in narrating instances of his sagacity, insight, and agility which they themselves had witnessed. He had been seen crossing the "flume" that spanned Grizzly Canyon at a height of nine hundred feet, on a plank six inches wide. He had tumbled down the "shoot" to the South Fork, a thousand feet below, and was found sitting on the riverbank "without a scratch, 'cept that he was lazily givin' himself with his off hind paw." He had been forgotten in a snowdrift on a Sierran shelf, and had come home in the early spring with the conceited complacency of an Alpine traveler and a plumpness alleged to have been the result of an exclusive diet of buried mail bags and their contents. He was generally believed to read the advance election posters, and disappear a day or two before the candidates and the brass band-- which he hated--came to the Ridge. He was suspected of having overlooked Colonel Johnson's hand at poker, and of having conveyed to the Colonel's adversary, by a succession of barks, the danger of betting against four kings. While these statements were supplied by wholly unsupported witnesses, it was a very human weakness of Rattlers Ridge that the responsibility of corroboration was passed to the dog himself, and HE was looked upon as a consummate liar. "Snoopin' round yere, and CALLIN' yourself a poker sharp, are ye! Scoot, you yaller pizin!" was a common adjuration whenever the unfortunate animal intruded upon a card party. "Ef thar was a spark, an ATOM of truth in THAT DOG, I'd believe my own eyes that I saw him sittin' up and trying to magnetize a jay bird off a tree. But wot are ye goin' to do with a yaller equivocator like that?" I have said that he was yellow--or, to use the ordinary expression, "yaller." Indeed, I am inclined to believe that much of the ignominy attached to the epithet lay in this favorite pronunciation. Men who habitually spoke of a "YELLOW bird," a "YELLOW-hammer," a "YELLOW leaf," always alluded to him as a "YALLER dog." He certainly WAS yellow. After a bath--usually compulsory--he presented a decided gamboge streak down his back, from the top of his forehead to the stump of his tail, fading in his sides and flank to a delicate straw color. His breast, legs, and feet--when not reddened by "slumgullion," in which he was fond of wading--were white. A few attempts at ornamental decoration from the India-ink pot of the storekeeper failed, partly through the yellow dog's excessive agility, which would never give the paint time to dry on him, and partly through his success in transferring his markings to the trousers and blankets of the camp. The size and shape of his tail--which had been cut off before his introduction to Rattlers Ridge--were favorite sources of speculation to the miners, as determining both his breed and his moral responsibility in coming into camp in that defective condition. There was a general opinion that he couldn't have looked worse with a tail, and its removal was therefore a gratuitous effrontery. His best feature was his eyes, which were a lustrous Vandyke brown, and sparkling with intelligence; but here again he suffered from evolution through environment, and their original trustful openness was marred by the experience of watching for flying stones, sods, and passing kicks from the rear, so that the pupils were continually reverting to the outer angle of the eyelid. Nevertheless, none of these characteristics decided the vexed question of his BREED. His speed and scent pointed to a "hound," and it is related that on one occasion he was laid on the trail of a wildcat with such success that he followed it apparently out of the State, returning at the end of two weeks footsore, but blandly contented. Attaching himself to a prospecting party, he was sent under the same belief, "into the brush" to drive off a bear, who was supposed to be haunting the campfire. He returned in a few minutes WITH the bear, DRIVING IT INTO the unarmed circle and scattering the whole party. After this the theory of his being a hunting dog was abandoned. Yet it was said--on the usual uncorroborated evidence-- that he had "put up" a quail; and his qualities as a retriever were for a long time accepted, until, during a shooting expedition for wild ducks, it was discovered that the one he had brought back had never been shot, and the party were obliged to compound damages with an adjacent settler. His fondness for paddling in the ditches and "slumgullion" at one time suggested a water spaniel. He could swim, and would occasionally bring out of the river sticks and pieces of bark that had been thrown in; but as HE always had to be thrown in with them, and was a good-sized dog, his aquatic reputation faded also. He remained simply "a yaller dog." What more could be said? His actual name was "Bones"--given to him, no doubt, through the provincial custom of confounding the occupation of the individual with his quality, for which it was pointed out precedent could be found in some old English family names. But if Bones generally exhibited no preference for any particular individual in camp, he always made an exception in favor of drunkards. Even an ordinary roistering bacchanalian party brought him out from under a tree or a shed in the keenest satisfaction. He would accompany them through the long straggling street of the settlement, barking his delight at every step or misstep of the revelers, and exhibiting none of that mistrust of eye which marked his attendance upon the sane and the respectable. He accepted even their uncouth play without a snarl or a yelp, hypocritically pretending even to like it; and I conscientiously believe would have allowed a tin can to be attached to his tail if the hand that tied it on were only unsteady, and the voice that bade him "lie still" were husky with liquor. He would "see" the party cheerfully into a saloon, wait outside the door--his tongue fairly lolling from his mouth in enjoyment--until they reappeared, permit them even to tumble over him with pleasure, and then gambol away before them, heedless of awkwardly projected stones and epithets. He would afterward accompany them separately home, or lie with them at crossroads until they were assisted to their cabins. Then he would trot rakishly to his own haunt by the saloon stove, with the slightly conscious air of having been a bad dog, yet of having had a good time. We never could satisfy ourselves whether his enjoyment arose from some merely selfish conviction that he was more SECURE with the physically and mentally incompetent, from some active sympathy with active wickedness, or from a grim sense of his own mental superiority at such moments. But the general belief leant toward his kindred sympathy as a "yaller dog" with all that was disreputable. And this was supported by another very singular canine manifestation--the "sincere flattery" of simulation or imitation. "Uncle Billy" Riley for a short time enjoyed the position of being the camp drunkard, and at once became an object of Bones' greatest solicitude. He not only accompanied him everywhere, curled at his feet or head according to Uncle Billy's attitude at the moment, but, it was noticed, began presently to undergo a singular alteration in his own habits and appearance. From being an active, tireless scout and forager, a bold and unovertakable marauder, he became lazy and apathetic; allowed gophers to burrow under him without endeavoring to undermine the settlement in his frantic endeavors to dig them out, permitted squirrels to flash their tails at him a hundred yards away, forgot his usual caches, and left his favorite bones unburied and bleaching in the sun. His eyes grew dull, his coat lusterless, in proportion as his companion became blear-eyed and ragged; in running, his usual arrowlike directness began to deviate, and it was not unusual to meet the pair together, zigzagging up the hill. Indeed, Uncle Billy's condition could be predetermined by Bones' appearance at times when his temporary master was invisible. "The old man must have an awful jag on today," was casually remarked when an extra fluffiness and imbecility was noticeable in the passing Bones. At first it was believed that he drank also, but when careful investigation proved this hypothesis untenable, he was freely called a "derned time- servin', yaller hypocrite." Not a few advanced the opinion that if Bones did not actually lead Uncle Billy astray, he at least "slavered him over and coddled him until the old man got conceited in his wickedness." This undoubtedly led to a compulsory divorce between them, and Uncle Billy was happily dispatched to a neighboring town and a doctor. Bones seemed to miss him greatly, ran away for two days, and was supposed to have visited him, to have been shocked at his convalescence, and to have been "cut" by Uncle Billy in his reformed character; and he returned to his old active life again, and buried his past with his forgotten bones. It was said that he was afterward detected in trying to lead an intoxicated tramp into camp after the methods employed by a blind man's dog, but was discovered in time by the--of course--uncorroborated narrator. I should be tempted to leave him thus in his original and picturesque sin, but the same veracity which compelled me to transcribe his faults and iniquities obliges me to describe his ultimate and somewhat monotonous reformation, which came from no fault of his own. It was a joyous day at Rattlers Ridge that was equally the advent of his change of heart and the first stagecoach that had been induced to diverge from the highroad and stop regularly at our settlement. Flags were flying from the post office and Polka saloon, and Bones was flying before the brass band that he detested, when the sweetest girl in the county--Pinkey Preston-- daughter of the county judge and hopelessly beloved by all Rattlers Ridge, stepped from the coach which she had glorified by occupying as an invited guest. "What makes him run away?" she asked quickly, opening her lovely eyes in a possibly innocent wonder that anything could be found to run away from her. "He don't like the brass band," we explained eagerly. "How funny," murmured the girl; "is it as out of tune as all that?" This irresistible witticism alone would have been enough to satisfy us--we did nothing but repeat it to each other all the next day-- but we were positively transported when we saw her suddenly gather her dainty skirts in one hand and trip off through the red dust toward Bones, who, with his eyes over his yellow shoulder, had halted in the road, and half-turned in mingled disgust and rage at the spectacle of the descending trombone. We held our breath as she approached him. Would Bones evade her as he did us at such moments, or would he save our reputation, and consent, for the moment, to accept her as a new kind of inebriate? She came nearer; he saw her; he began to slowly quiver with excitement--his stump of a tail vibrating with such rapidity that the loss of the missing portion was scarcely noticeable. Suddenly she stopped before him, took his yellow head between her little hands, lifted it, and looked down in his handsome brown eyes with her two lovely blue ones. What passed between them in that magnetic glance no one ever knew. She returned with him; said to him casually: "We're not afraid of brass bands, are we?" to which he apparently acquiesced, at least stifling his disgust of them while he was near her--which was nearly all the time. During the speechmaking her gloved hand and his yellow head were always near together, and at the crowning ceremony--her public checking of Yuba Bill's "waybill" on behalf of the township, with a gold pencil presented to her by the Stage Company--Bones' joy, far from knowing no bounds, seemed to know nothing but them, and he witnessed it apparently in the air. No one dared to interfere. For the first time a local pride in Bones sprang up in our hearts-- and we lied to each other in his praises openly and shamelessly. Then the time came for parting. We were standing by the door of the coach, hats in hand, as Miss Pinkey was about to step into it; Bones was waiting by her side, confidently looking into the interior, and apparently selecting his own seat on the lap of Judge Preston in the corner, when Miss Pinkey held up the sweetest of admonitory fingers. Then, taking his head between her two hands, she again looked into his brimming eyes, and said, simply, "GOOD dog," with the gentlest of emphasis on the adjective, and popped into the coach. The six bay horses started as one, the gorgeous green and gold vehicle bounded forward, the red dust rose behind, and the yellow dog danced in and out of it to the very outskirts of the settlement. And then he soberly returned. A day or two later he was missed--but the fact was afterward known that he was at Spring Valley, the county town where Miss Preston lived, and he was forgiven. A week afterward he was missed again, but this time for a longer period, and then a pathetic letter arrived from Sacramento for the storekeeper's wife. "Would you mind," wrote Miss Pinkey Preston, "asking some of your boys to come over here to Sacramento and bring back Bones? I don't mind having the dear dog walk out with me at Spring Valley, where everyone knows me; but here he DOES make one so noticeable, on account of HIS COLOR. I've got scarcely a frock that he agrees with. He don't go with my pink muslin, and that lovely buff tint he makes three shades lighter. You know yellow is SO trying." A consultation was quickly held by the whole settlement, and a deputation sent to Sacramento to relieve the unfortunate girl. We were all quite indignant with Bones--but, oddly enough, I think it was greatly tempered with our new pride in him. While he was with us alone, his peculiarities had been scarcely appreciated, but the recurrent phrase "that yellow dog that they keep at the Rattlers" gave us a mysterious importance along the countryside, as if we had secured a "mascot" in some zoological curiosity. This was further indicated by a singular occurrence. A new church had been built at the crossroads, and an eminent divine had come from San Francisco to preach the opening sermon. After a careful examination of the camp's wardrobe, and some felicitous exchange of apparel, a few of us were deputed to represent "Rattlers" at the Sunday service. In our white ducks, straw hats, and flannel blouses, we were sufficiently picturesque and distinctive as "honest miners" to be shown off in one of the front pews. "WILL you look at Bones?" We looked. Bones had entered the church and gone up in the gallery through a pardonable ignorance and modesty; but, perceiving his mistake, was now calmly walking along the gallery rail before the astounded worshipers. Reaching the end, he paused for a moment, and carelessly looked down. It was about fifteen feet to the floor below--the simplest jump in the world for the mountain-bred Bones. Daintily, gingerly, lazily, and yet with a conceited airiness of manner, as if, humanly speaking, he had one leg in his pocket and were doing it on three, he cleared the distance, dropping just in front of the chancel, without a sound, turned himself around three times, and then lay comfortably down. Three deacons were instantly in the aisle, coming up before the eminent divine, who, we fancied, wore a restrained smile. We heard the hurried whispers: "Belongs to them." "Quite a local institution here, you know." "Don't like to offend sensibilities;" and the minister's prompt "By no means," as he went on with his service. A short month ago we would have repudiated Bones; today we sat there in slightly supercilious attitudes, as if to indicate that any affront offered to Bones would be an insult to ourselves, and followed by our instantaneous withdrawal in a body. All went well, however, until the minister, lifting the large Bible from the communion table and holding it in both hands before him, walked toward a reading stand by the altar rails. Bones uttered a distinct growl. The minister stopped. We, and we alone, comprehended in a flash the whole situation. The Bible was nearly the size and shape of one of those soft clods of sod which we were in the playful habit of launching at Bones when he lay half-asleep in the sun, in order to see him cleverly evade it. We held our breath. What was to be done? But the opportunity belonged to our leader, Jeff Briggs--a confoundedly good-looking fellow, with the golden mustache of a northern viking and the curls of an Apollo. Secure in his beauty and bland in his self-conceit, he rose from the pew, and stepped before the chancel rails. "I would wait a moment, if I were you, sir," he said, respectfully, "and you will see that he will go out quietly." "What is wrong?" whispered the minister in some concern. "He thinks you are going to heave that book at him, sir, without giving him a fair show, as we do." The minister looked perplexed, but remained motionless, with the book in his hands. Bones arose, walked halfway down the aisle, and vanished like a yellow flash! With this justification of his reputation, Bones disappeared for a week. At the end of that time we received a polite note from Judge Preston, saying that the dog had become quite domiciled in their house, and begged that the camp, without yielding up their valuable PROPERTY in him, would allow him to remain at Spring Valley for an indefinite time; that both the judge and his daughter--with whom Bones was already an old friend--would be glad if the members of the camp would visit their old favorite whenever they desired, to assure themselves that he was well cared for. I am afraid that the bait thus ingenuously thrown out had a good deal to do with our ultimate yielding. However, the reports of those who visited Bones were wonderful and marvelous. He was residing there in state, lying on rugs in the drawing-room, coiled up under the judicial desk in the judge's study, sleeping regularly on the mat outside Miss Pinkey's bedroom door, or lazily snapping at flies on the judge's lawn. "He's as yaller as ever," said one of our informants, "but it don't somehow seem to be the same back that we used to break clods over in the old time, just to see him scoot out of the dust." And now I must record a fact which I am aware all lovers of dogs will indignantly deny, and which will be furiously bayed at by every faithful hound since the days of Ulysses. Bones not only FORGOT, but absolutely CUT US! Those who called upon the judge in "store clothes" he would perhaps casually notice, but he would sniff at them as if detecting and resenting them under their superficial exterior. The rest he simply paid no attention to. The more familiar term of "Bonesy"--formerly applied to him, as in our rare moments of endearment--produced no response. This pained, I think, some of the more youthful of us; but, through some strange human weakness, it also increased the camp's respect for him. Nevertheless, we spoke of him familiarly to strangers at the very moment he ignored us. I am afraid that we also took some pains to point out that he was getting fat and unwieldy, and losing his elasticity, implying covertly that his choice was a mistake and his life a failure. Add A Yellow Dog to your own personal library.